Minnie and Emma launched their beautiful stationery company today and wanted to share the news with decor8 readers. To celebrate, you will receive free ground shipping on your first order, simply enter "Welcome" upon checkout. Their monkey baby announcements and the blue and brown moving announcements are my favorites. I just love how you can select your own lining for the envelopes. So classy. Love it. 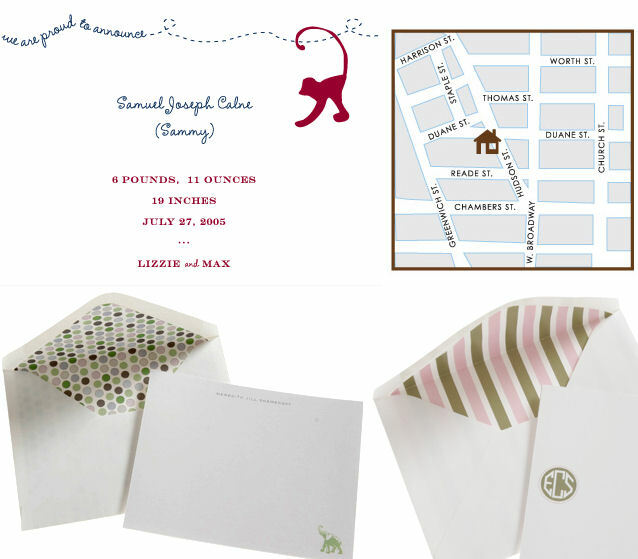 Speaking of class, did you catch the crown stationery? Regal charm all the way. I'm thinking of ordering this with the navy/red vintage print interior. Swoon! Thanks Meredith for the tip!